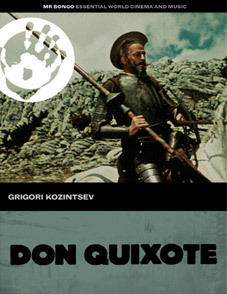 There have been a lot of film adaptations of of Miguel de Cervantes' classic novel Don Quixote over the years, yet one of the most acclaimed has for years been one of the hardest to see, the 1957 Russian version directed by renowned Russian filmmaker Grigori Kozintse, he of Belinskiy (1953) and Hamlet (1964). The first version of the novel shot in colour and cinemascope, it was filmed on location in the Crimean region it stars one of Soviet cinema's finest actors, Nikolai Cherkasov (Alexander Nevsky, Ivan the Terrible). After years spent reading books of chivalry, a middle-aged Spanish gentleman is convinced that he is the real-life knight-errant, Don Quixote de la Mancha. To this end, he commissions his battered horse Rocinante to be his steed and appoints fellow Manchegan Sancho Panza (Yuri Tolubeyev – Hamlet) to be his reluctant squire. Both Knight and Squire find themselves living anachronisms in 16th Century Spain, subject to constant humiliation and frequent defeat; safeguarded only by Sancho's good humour and Quixote's mad zeal. Described as "brilliant" by the New York Times and "witty elegant and touching" by Time Out, Don Quixote will be released on UK DVD on24th September 2012 by Mr. Bongo Films at the RRP of £9.99. Once again (what is it with today?) no details of extra features have been detailed. That we haven't been able to track down a trailer for this one will probably suprise no-one.